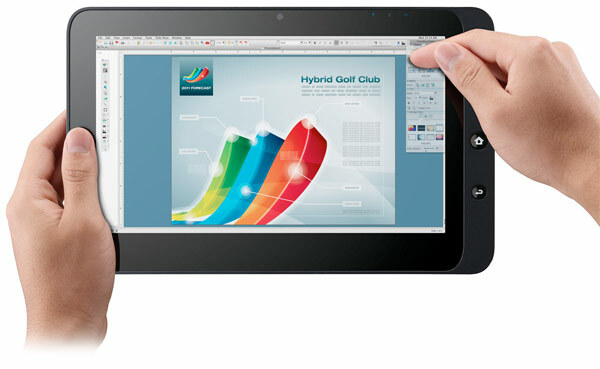 We had covered the Android based ViewPad 7 and Viewpad 10 tablets from ViewSonic in the past. The special feature about ViewPad 10 is that it is a dual-booting Android/Windows7 tablet. It was long due to be started to shipped to America. As Engadget is reporting, it has now finally started shipping to America. The timings of starting of its shipment looks no good with the whole world going ga-ga about the shining new bright iPad2 recently announced. But for the interested folks, it would still be an excitement to experience a dual-booting tablet. It’s just not the dual-booting feature in the armour of ViewPad 10 that you should be excited about, if you don’t know the complete specs. To start with, it features a 10.1 inch touchpanel with a resolution of 1024 x 600. Powered by 1.66 Ghz Atom CPU, 2 GB RAM, Bluetooth 2.1, 802.11 b/g/n Wi-Fi. If that’s not enough for you. it also has one 1.3 megapixel front-facing camera and will run on Android 1.6 (did someone just yawn?). It will come with Windows 7 in two version: one with a copy of Windows Home 7 Premium (with 16 GB SSD) and one with Windows 7 Professional (with 32 GB SSD). The two version will be priced $599 and $679 respectively. Still interested in this dual-booting ViewPad 10? Then the magic will work for you and you may go ahead to order this one.